A CC-138 Twin Otter aircraft from 440 Squadron, taxis across the ice of McClintock Inlet, Ellesmere Island, during OP NUNALIVUT 08. Un aéronef CC138 Twin Otter du 440e Escadron circule sur la surface glacée du Passage McClintock, à lîle dEllesmere, pendant lOp Nunalivut 08. RCAF engineers are on the ice north of Inuvik preparing a 440 Squadron Twin Otter to be rescued by a heavy lift helicopter. One of the squadron’s four ski-equipped Twin Otters suffered nose gear damage while the crew was landing on sea ice about 140 km north of Inuvik on March 11. The plane hit a snowdrift, causing damage serious enough that it couldn’t be taken off again. Four people on the aircraft were uninjured but had to be rescued by helicopter. 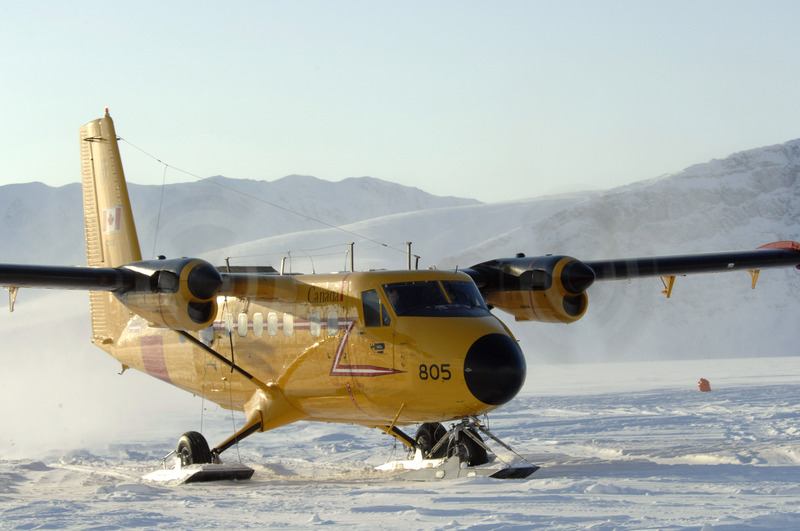 The Twin Otter is still on the ice and the RCAF has to hire a heavy lift helicopter to bring it to Inuvik. Engineers also have to build a berm to allow the aircraft to be slung under the big helicopter. It’s hoped the plane can be moved this week.The aircraft was taking part in Operation Nanook-Nunalivut, a regular Arctic readiness exercise when it was damaged.